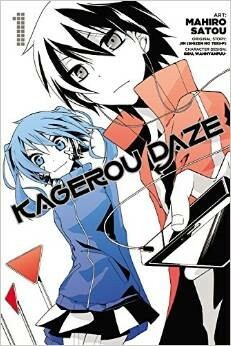 Kagerou Daze is a story based upon a popular series of songs by Jin (Shizen No Teki-P) called Kagerou Project. Jin’s songs were extremely popular on Niconico and six light novels have since been released. The manga adaptation became serialized in Monthly Comic Gene in June 2012. A brief 12 episode anime even followed – that’s how popular this series became! Can you see the power and influence of uploading your stuff to the internet? If not, you’re not working hard enough! Now onto the story! Volume 1 happens two years after a series of events that led to the main character’s isolation. We are introduced to Shintaro Kisaragi, who is a NEET. His only companion is a program he accidentally downloaded from an email a year ago. The program took over his whole computer and represents itself as a girl named “Ene.” She torments him and modifies or deletes the music he creates. One day her teasing goes too far and she deletes a song he is working on. The situation was so distressing that Shintaro freaked out and accidentally spilled soda all over his keyboard and mouse. Since it’s August 14th, if he orders a new keyboard and mouse online, he won’t receive it until August 17th because stores wont deliver during the Obon festival. So what does Shintaro have to do? You guessed it. He needs to actually go outside since he can’t cope with the idea of going two whole days without his PC. While adventuring through a department store on a quest for his keyboard and mouse, Shintaro walks right into a hostage situation! The whole store is taken by thugs who have a serious list of demands. Using the PC section and Ene, Shintaro takes the situation into his own hands while working with his sister and her gang, the Mekakushi Dan, to thwart the criminals’ plans. The story is interesting because it follows the life of a relatively boring guy. It just so happens that the narrator is following Shintaro on two of his more unique days. He actually goes outside and crazy things happen. He goes to the store, he meets a gang, he goes to an amusement park. Who can manage to do all of that in a span of 42 hours? Well, I suppose it technically could happen. I like to imagine that this story is a “what if” about Hatsune Miku. What if… she developed her own AI. What if… she detached herself from Vocaloid and became a downloadable “virus” who took over your computer? This could be a college student’s worst nightmare. Imagine writing a paper for days only to have some AI delete it! My imagination is running away right now so let us return to reality. You’ll really like this manga if you’re familiar with the Kagerou Project. I think this series is worth following. The manga has beautiful illustrations that are crisp and clean. The illustration style reminds me of Apple’s silhouette advertising campaign for the Ipod. If you’re looking for a heavily detailed style, this isn’t for you. If you enjoy the art and think this is a manga worth reading, you may find yourself re-reading a few times if you’re not familiar with the Kagerou Project, like me. Although I thoroughly enjoyed the first volume’s story, I had a hard time understanding the plot. This is probably because the narrative jumps around between the past and present and I don’t have the background since I’m not familiar with Jin’s music. I definitely found myself flipping back and forth a few times to understand what has happened. I also needed to flip through the book one more time to write this article. I am definitely interested in where the story may go, making volume 2 a definite must; however, readers may want to be aware that this particular manga requires a little extra effort on the reader’s part.